With Apple's new "Next Generation MacBook Pro" being the headliner in terms of new hardware introduction at WWDC, there is obviously considerable interest in how the new model compares with the previous design, which continues to be offered in both 13-inch and 15-inch sizes. It's 0.71-inches thick, or roughly 25 percent thinner than the current generation Pros (which, by the way, live on -- except for the 17-incher). That's just .03-inches thicker than the 13-inch MacBook Air, but it feels like quite a bit more. Where the Air is tapered, this has a constant thickness throughout. So, again, it doesn't feel like an Air, but it's a big improvement over the Pro. On the right side you have an SD card reader, full-size HDMI port and the first USB 3.0 port. (Which, by the way, is not blue -- Apple just made all the ports 3.0 and they're all naturally white.) On the other side is the other USB 3.0 port along with dual Thunderbolt ports, a headphone jack and the new MagSafe 2 connector. 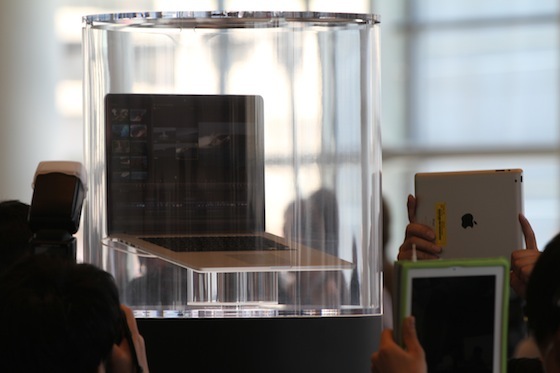 Update: The Verge has also posted a gallery of hands-on photos of the new MacBook Pro. i always LOL at people taking pics with their iPad like that, it looks hilarious. I expect to see poor college kids with $2000+ macbook pros at Starbucks soon browsing for jobs. My heart says yes, but my wallet says no. Will someone tell the engadget guy to NEVER, EVER, scratch two macbooks against each other like in this video? I can feel it down my spine! I know it's pointless, but I'm still going to say it. It would've been a lot more attractive to me at $1799. Something about crossing over the $2000 mark puts a "slow" sign up for me. Notice I didn't say "no". I said "slow". Can someone please explain the HDMI out? To me it makes almost no sense. Have you never seen a television in the past six years?